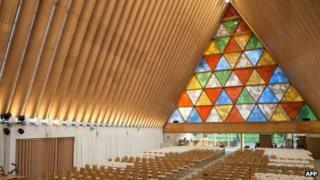 New Zealand's city of Christchurch has formally marked the completion of its new cardboard cathedral with a dedication service. The structure, which uses thick cardboard tubes, temporarily replaces the one damaged by the 2011 earthquake until a permanent one can be built. Church officials say the completion marks a milestone in the city's recovery efforts. The 22 February quake left 185 people dead and many buildings badly damaged. The 6.3-magnitude earthquake badly damaged the old Christchurch cathedral, which was built in the late 19th century. Church officials said in March that it was beyond repair and had to come down. Japanese architect Shigeru Ban designed the cardboard cathedral. The triangular A-frame design includes stained glass windows, can seat 700 people and is built to last for half a century. The building is meant to be waterproof, although last month some of the cardboard tubing became soggy and had to be replaced after a heavy downpour. "The old cathedral symbolised the city in many ways and we think this cathedral is a symbol that Christchurch is regrouping and rebuilding," acting dean Lynda Patterson told Agence-France Presse. "The community has a cathedral again. It's a place where people can come for quiet contemplation in the city centre and somewhere we can hold concerts and art exhibitions."